US Air Force: Nearly $5B needed for hurricane, flood damage | Insurance Litigation Group, P.A. 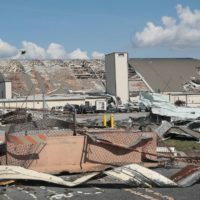 The U.S. Air Force detailed the needs and costs to rebuild two Florida Panhandle Hurricane Michael ravaged bases, costing nearly $5 billion. They are Tyndall and Offutt. Like many homeowners in the Panama City Beach area, Hurricane Michael dished out a combination of flooding from the tremendous storm surge combined with Cat 4 winds that created significant property damage. What many Panhandle homeowners and business owners learned from the aftermath of Hurricane Michael, is that traditional homeowners and business insurance policies do not cover damage from floods resulting from storm tides or rain water overwhelming storm drainage systems. That is where the Federal Flood Insurance program comes into plan as well as some private flood insurance policies. There is no question that insurance is a very complex topic that is now affecting the lives and well being of area residents. The attorneys and claims consultants at Insurance Litigation Group have been assisting Hurricane Michael victims in interpreting their insurance policies, reviewing the claims they have already made and inspecting their damage, all with the objective of helping victims get what they are entitled to from their insurance companies, adequate funds to make the necessary repairs to get their lives back.